L’Aigle, north west France. A speaker blasts out an Oasis song ahead of the Tour of Normandy’s fourth stage, to which one of Team Wiggins’s mechanics sings along. Locals come up to the squad’s fleet of vehicles – most notably its Jaguar Sportbrake – and Pinarello F8 bikes to take photographs, while others ask soigneurs for bidons and riders for autographs. If Bradley Wiggins wanted an insight to what his road racing life away from Sky will be like, the scene from a stage start in this French commune probably won’t be much removed from the truth once he joins the squad that bears his surname. Nor will it be that different from what he’s used to. Team Wiggins made its debut in the seven stage French race at the end of March, just 11 weeks after it was officially unveiled. Prior to Friday, when the Tour de France winner will race in its colours for the first time at the Tour de Yorkshire, it has been without its talisman. However, attention is something it won’t lack. Since Normandy, the team have ironed out the handful of teething problems on show in the French race, those that often blight new setups. In the opening stage’s prologue, a 3.6-kilometre prologue around Saint-Lô, riders wore plain black Rapha skinsuits as the clothing manufacturer had not finished preparing team issue versions in time. A number of the Zipp wheels raced in France were previously used in 2014 by Omega Pharma-Quick Step (some still bore the names of Boonen, Meersman and Trentin on them), and the team’s vehicles had not been liveried. 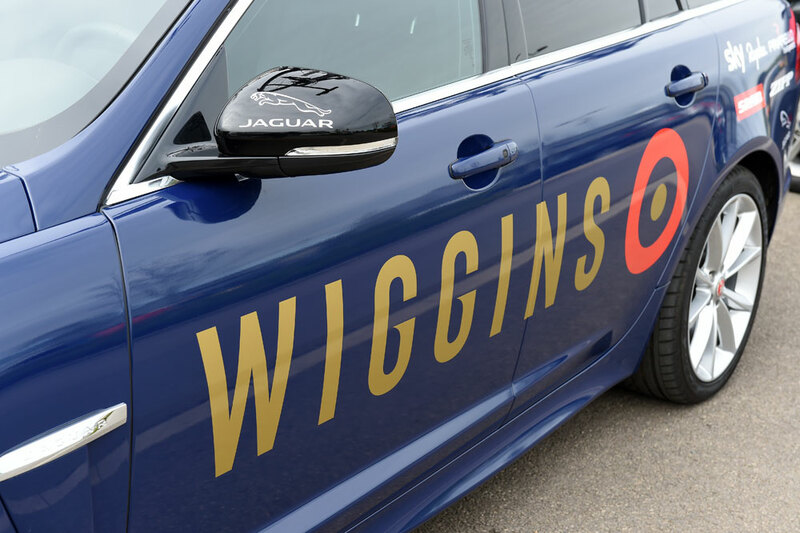 Team Wiggins’s vehicles have been branded since its debut at the Tour of Normandy. Arguably the team’s biggest surprise thus far is that it arrived in Normandy with SRAM-equipped bikes, particularly since the team were in negotiations with Campagnolo to ride the Italian manufacturer’s groupset. Tennant, who has also ridden for Motorpoint, Rapha Condor-Sharp and Madison-Genesis, recorded the team’s first top-10 result when he placed eighth on stage two. 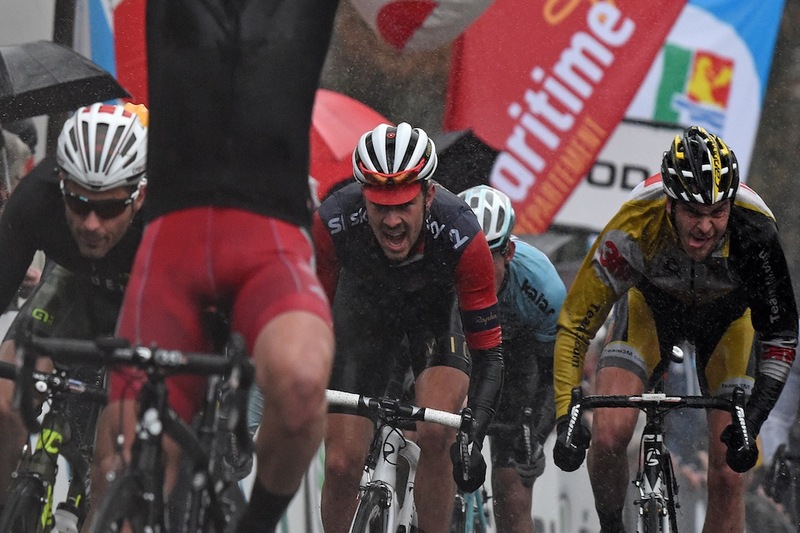 The 27-year-old was a debutant in the race which – because of its calendar position, now-traditional inclement weather, grippy roads and six-man teams – is known for being one of the toughest races of a season. It was a combined decision from Heiko Salzwedel, the GB men’s endurance coach, and Cope to enter the French race. The pair will collaborate on selecting the events the team will ride and if – as per the four-day Challenge Majorca in February, in which Team Wiggins was expected to make its competitive debut – Ed Clancy’s JLT-Condor team is not competing, Team Wiggins’s pursuiters and Clancy will compete in GB colours. Normandy fell into one of Salzwedel’s distinct training blocks: this one a three-week endurance phase. Immediately before the race, Tennant and the three other Great Britain endurance squad members (Mark Christian, Jon Dibben and Owain Doull) who rode for Team Wiggins in Normandy, and Clancy, were training at altitude in Tenerife. “I went hard to begin with in Tenerife, and I had to knock it back a bit in the middle,” added Tennant. “It’s only our second camp there, I still don’t know what to expect from them, and I was expecting a lot worse from this race, even though the short, sharp climbs suit me. 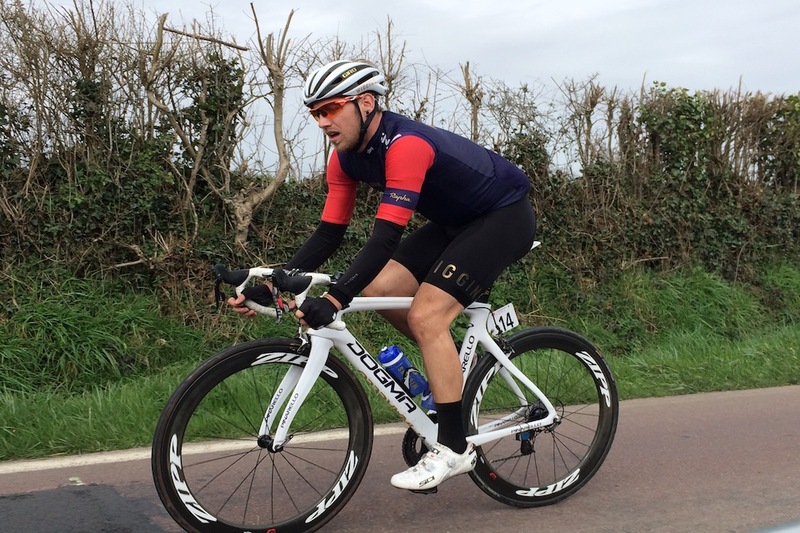 The team’s line-up in France was completed by Patten and GB Academy member Chris Lawless; the latter had a 12-hour travel day to make it from a track event in San Sebastian, northern Spain, to make the race start in time. As part of its links with British Cycling, Team Wiggins can bolster its roster by selecting those emerging talents on the Academy for events. Because of Salzwedel’s training plans, it is Britain’s stars of tomorrow who will likely ride for the squad in the opening rounds of this year’s Tour Series, before the established names return halfway through. Academy managers Keith Lambert and Chris Newton put forward Lawless’s name for a possible Normandy selection to Cope. “The original plan was to bring a couple of the Academy lads across and give them opportunities to ride for the team, beginning in May,” said Cope. “Keith decided Chris was ready to move across now, which gave us an extra rider to select from. The 19-year-old’s race ended on the penultimate stage, after he tweaked his hamstring having been felled in a crash. “It was exciting,” said Lawless of his participation. “With the name of the team, and its riders, being here was good for morale. Dibben abandoned on the same stage as Lawless after being sick shortly after the race split into numerous echelons alongside the famous Utah Beach. Because of the dirt from the roads riders ingest during the race – in particular that from its numerous farms – falling ill at the race isn’t a rarity. Welshman Owain Doull secured the team’s best result of the week when he finished third on stage four’s uphill finish into the spa town of Bagnoles-de-l’Orne. “It was always the stage we were looking towards, we rode well as a team,” he said. “I thought we’d all be there or thereabouts after the Tenerife camp. Cope added that the team’s pulling on the front during the stage, which kept a breakaway group including Madison-Genesis’s Mike Northey in check, raised some eyebrows among his fellow directeurs. “I had one of the Dutch directors come up to me in the convoy as ask what the hell we were doing,” he said. “We didn’t want to get caught out in the narrow roads we were approaching when we were on the front. Doull gained a four-second bonus for finishing third in Bagnoles, but it was largely the bonnifications that kept him from finishing on the podium. The Welshman – who was set to sign for Europcar at one point last autumn – finished 10th overall, 21 seconds off winner Dimitri Claeys (Verandas Willems). Tennant and Christian were a further 15 seconds behind in 17th and 18th overall. Since Normandy, the team has competed in the opening two rounds of this year’s Elite Road Series: off-road rider Iain Paton was its only finisher at the Chorley GP, in 67th, while Tennant finished on the podium at the two-day Tour of the Reservoir. 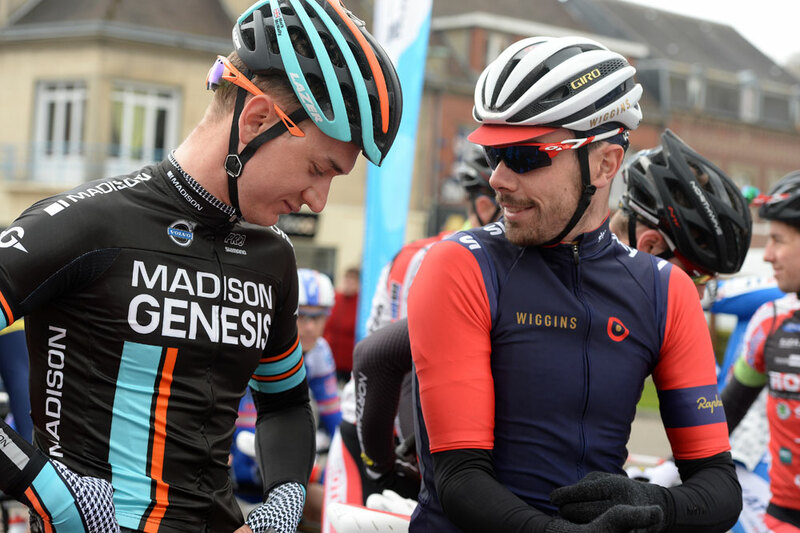 The latter was also Team Wiggins’s best-placed finisher in Sunday’s Rutland-Melton CiCLE Classic, placing 14th in the bunch sprint. A win still eludes them – but given Wiggins’s participation in Yorkshire this weekend, it’s unlikely that many people care.